This is water with high concentrations of minerals in it—namely, calcium and magnesium. You’ve likely heard of the many health benefits of these particular minerals in the foods you eat, which again, makes homeowners underestimate the harmfulness. The real danger that hard water poses is to the pipes snaking their way through your home. Over years of hard water exposure, the lining of your pipes start to accumulate buildup from these minerals—what you recognize as limescale. Why should you care if you have limescale growing in your home’s plumbing system? You can just clean it off your shower walls and drain openings, right? Well, think about it—the buildup that is visible to you is also inside your plumbing pipes. Eventually, this can and will restrict the flow of water, reducing water pressure in your system and making it harder for your plumbing to function. Even worse, this limescale buildup hardens over time, and makes it hard to remove the scale without damaging your plumbing. Before you say, “Well, I’ll just buy some drain cleaner,” we want to stress how caustic and bad chemical store-bought drain cleaner is for your drains! Unfortunately, these so-called solutions will also eat away at the pipes in your plumbing, leading to corrosion and leaks. Yes! The best way to manage hard water and its effects is by having a whole-house water treatment system installed directly into your home’s main water line. This system is a type of water treatment system designed especially to combat hard water. 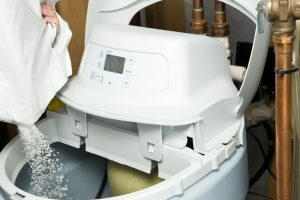 There are different types of water softeners, but in general, they work by neutralizing the magnesium and calcium particles, softening the water so limescale never has a chance to form. If you’re still unsure if hard water is really a problem in your home, give our team a call. Typically you’ll be able to notice limescale buildup in the form of a white substance around your drain openings, faucets, and your shower walls. But the best way to know for sure is to allow us to perform professional water testing.